Organisations are adopting virtualization and are increasingly migrating to Virtual DataCenter. Xen Hypervisor is an open source virtual platform provided by Citrix to Integrate, Manage and Automate a Virtual Datacenter. Xen hypervisor is used to virtualize operating systems like Windows, Linux, Solaris. 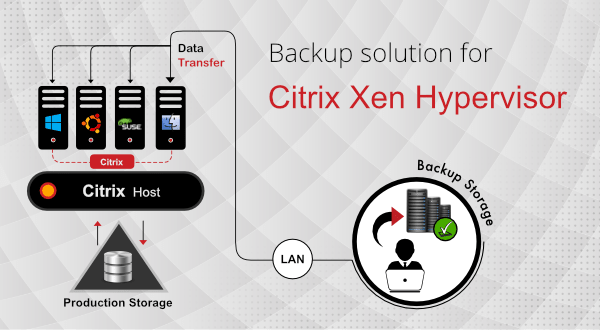 To alleviate the risks around the Virtual Machines (VM) running on the Xen hypervisor, it is required to have a Backup and Disaster recovery solution. Vembu provides VM-level and Guest level backups to protect the VM’s running in the Xen Hypervisor environment. Vembu offers ImageBackup agent for the Windows VMs running on Xen Hypervisor and the agent needs to be installed on each VM to backup the entire VM including OS, Application and data. Full VM Backup – Protects entire VM including operating system, application and other data in a single pass to ensure the business continuity. Changed Block Tracking – Vembu uses proprietary CBT Driver for efficient block level incremental backup. Automated Backup Verification – The backed up VMs will be automatically booted and the screenshot of the boot screen will be captured and emailed to the administrator. Application-aware VM Backups – Uses application specific VSS writers to take consistent snapshots during the backup of highly transactional applications (Microsoft Exchange, SQL, SharePoint and Active Directory) and the log files can be truncated at the end of backup. Microsoft SQL Server Backup – Vembu SQL Server backup is a flexible and efficient option to backup Microsoft SQL servers. Vembu uses VDI API to backup database(s) and then uploads the locally dumped file to the BDR backup server.